We are out in California for Christmas, and I had the chance to try several beers for Christmas. We purchased a bottle of Samuel Adams Infinium, the new champagne beer produced in collaboration with Weihenstephan. We were given a bottle of Heritage 100 2010 from BJ's Breweries. We also enjoyed a glass of BJ's Grand Cru 2011. Samuel Adams Weihenstephan InfiniumSam Adams and Weihenstephan set out to create an entirely new type of beer. This beer is brewed under the restrictions of the Reinheitsgebot, only water, barley, hops, and yeast. A second fermentation is used to add carbonation, like champagne, so the beer has has the dry crispness typical of champagne. 10.3% ABV. Slightly sweet, with a slight wet dog scent. The taste is amazing. I would recommend this beer for almost anyone. Well worth $20. 1 beer. BJ's Heritage 100A small batch beer from BJs Breweries. This was given to me by a relative who works for BJs. The beer is fresh hopped, so unlike previous editions it cannot be aged. The scent is wet dog up front, and ends up citrusy. This is a golden ale, think of a watered down trippel. Less body, less hops. 5.7% ABV. Three beers. BJ's Grand CruWe enjoyed the BJ's Annual Grand Cru at BJ's Restaurant. This is the 2011 version, 10.0% ABV. 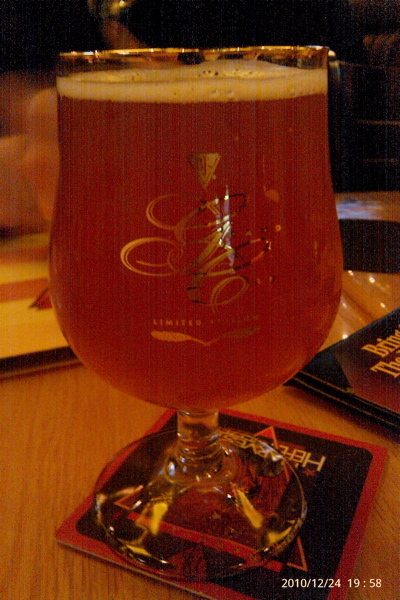 A Belgian Gold Ale, it is sweet and spicy, exceptionally delicious. I ate BJ's open face chili cheeseburger with this, and found it an excellent combination. 1 beer.